First, that a notoriously hostile 2009 Planet Money interview between Davidson and Elizabeth Warren—the special adviser to the Consumer Financial Protection Bureau—was ethically tainted by Planet Money‘s financial arrangements with “the sole sponsor underwriting Davidson’s Planet Money show and his salary.” Levine and Ames argue that the sponsor in question—a financial services conglomerate—lobbied against the creation of the CFPB before it was created (and around the time of the interview), which is evidence of an insidious conflict of interest. Furthermore, they allege that Davidson is accepting speaking fees from the industry he covers for both NPR and The New York Times Magazine, something largely viewed as an unsavory, questionable practice by most journalists (and journalism institutions, which usually have guidelines against that sort of thing). Adam Davidson is the co-creator and host of the popular economic news radio program Planet Money. On air, Davidson plays the role of an earnest, brainy reporter who’s doing his best to make sense of the complicated, jargon-filled world of finance to report business news in a way that NPR listeners can understand. However, behind the dweeby, faux-naive facade Adam Davidson presents to his listeners is a shrewd propagandist with a long, consistent history of shilling for powerful and destructive interests—and failing to disclose his financial ties to the companies and industries he reports on. While Adam Davidson has recently come under increasing scrutiny for using his NPR platform to promote the narrow interests of the super-wealthy in this country, little attention has thus far been given to Davidson's corruption—his numerous financial conflicts of interest that seriously undermine his claims to being a journalist, and instead reveal Davidson as a glorified product spokesman for his Wall Street sponsors. Adam Davidson gained national media recognition as an on-air personality in 2008, after co-producing an episode for This American Life called "The Giant Pool of Money" about the implosion of subprime lending. Although Davidson's segment was praised for making the murky world of finance easier to understand, his framing of the subprime housing debacle served another purpose: It let Wall Street off the hook for its role in rampant criminal mortgage fraud and predatory lending. "This was a crisis that was caused by willing participation of every single person. 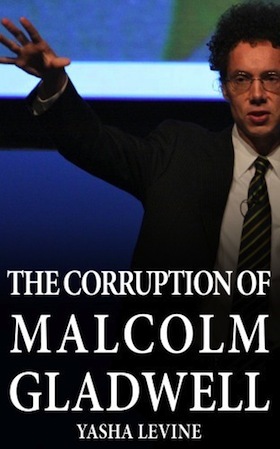 Nobody was coerced," said Davidson's co-producer and partner in Planet Money, Alex Blumberg. "And there was fraud. But that was not what caused the crisis. What caused the crisis was something bigger and more systemic that required the involvement of everybody at every step." This evasion-by-exaggerating-the-complexity strategy is one that Davidson and Planet Money have deployed often to whitewash and deflect the role of criminality in the housing crisis. Among the show's fans was Treasury Secretary and former New York Federal Reserve Bank chief Timothy Geithner: "Yeah, they did a good job." As a piece of journalism, Davidson's report on the subprime fraud was a failure bordering on journalistic malpractice. By absolving the role of rampant predatory criminality and spreading blame in a grand false equivalency, Davidson provided a narrative frame that comforted the American Establishment at a time when it badly needed comforting, and was duly rewarded for his services. The mainstream media joined Timothy Geithner in lavishing praise on Davidson's subprime fraud whitewash, and awarded him and his partner with the prestigious "Peabody Award" while New York University's Journalism Institute named the segment one of the "Top Ten Works of Journalism of the Decade." Thanks to this broad acceptance and praise of Davidson's whitewash, he was given his own show, which launched just as the entire financial system began to melt down. The new show, called Planet Money, was a partnership between NPR and Chicago Public Media's This American Life, and was molded on Davidson’s successful subprime episode. Not surprisingly, Planet Money was compromised almost from the very start. 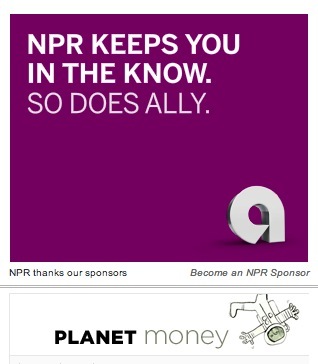 In early 2009, just a few months after Planet Money was launched, NPR announced it had secured Ally Bank (formerly GMAC) as the show's exclusive sponsor. It was an unusual setup for NPR, and unusual (and highly dubious) for anything that called itself journalism, because it meant that a major troubled financial institution was the only source of money for a news program about finance. At the time that the unusual agreement was signed, Planet Money was the only NPR program underwritten by a single exclusive sponsor. 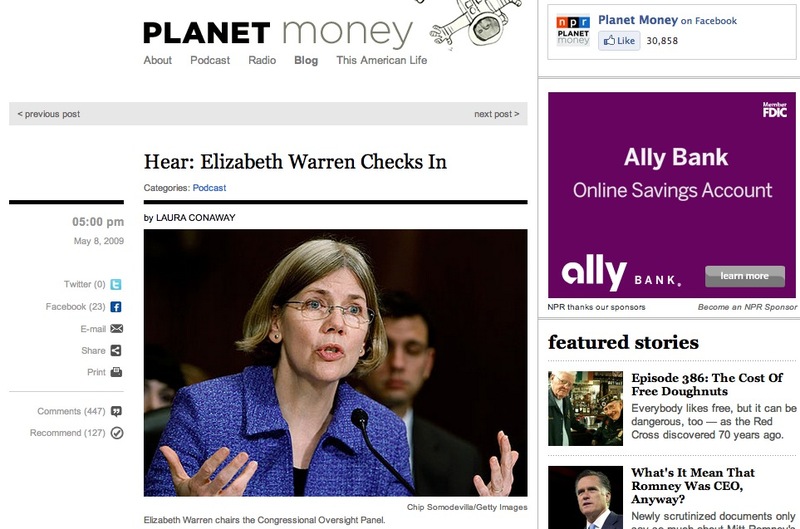 The arrangement raised eyebrows and would have been unthinkable before the crisis—but even by post-crisis funding arrangements, Planet Money's deal with Ally Bank stood out as such an obvious violation of basic journalism standards that even Ad Age, the advertising industry's trade publication, was taken aback by the "close alignment of message and news program." At the time Ally signed its sponsorship agreement with Planet Money, the bank was being investigated across the country for foreclosure fraud, robo-signing fraud, and student loan fraud. 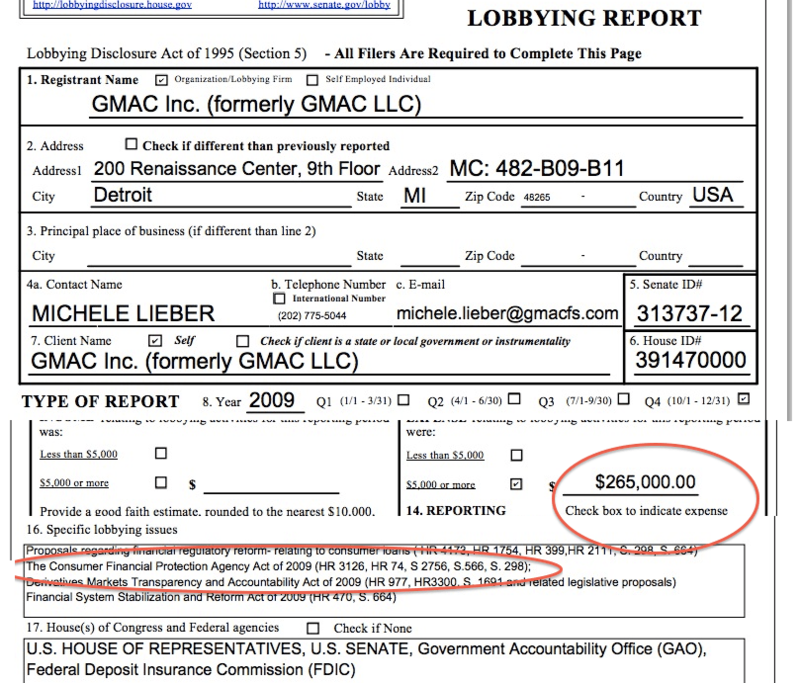 Even as bad bailed-out banks go, GMAC/Ally is considered one of the worst, most tainted of them all. Planet Money's relationship with Ally is a textbook example of a “conflict of interest" of the sort every journalist is taught to shun. The bank had a clear and demonstrable interest in Planet Money's coverage of the financial industry, especially issues that affected the bank’s bottom line. As Planet Money's sole sponsor at a time when NPR funds were falling, Ally obviously wielded considerable power. After Davidson sprang a vicious and bizarre smear-attack on Elizabeth Warren in 2009, some NPR listeners started to get wise to Planet Money's corruption problem, and made their concerns known. Following months of complaints from readers pointing to the conflict of interest and the way Planet Money's segments dovetailed with the banking lobby's own propaganda—and with Ally's interests—NPR’s Ombudsman was forced to issue a public statement on the Ally-Planet Money relationship. Perhaps not surprisingly, the NPR Ombudsman decided that listeners' concerns over the conflict-of-interest were "cynical"—as if the problem lay in listeners' psychology, rather than in Planet Money's violation of basic journalism ethics. The NPR Ombudsman went further, arguing essentially that if listeners who complained about corruption weren't cynical, then they were ignorant. Despite Davidson's long experience in sales and underwriting for public radio, he claimed he was out of the loop when it came to the deal his own show, Planet Money, cut with its sole sponsor, Ally Bank: "I have nothing to do with the underwriting stuff. We don't pay any attention to the fact that they are a sponsor. We wouldn't for a second give them any special treatment — positive or negative." And yet, the actual record proves that NPR readers were right to suspect and criticize the arrangement, and that Davidson was wrong in claiming that Planet Money has not consistently pushed a narrative so in synch with Ally Bank and the financial industry that it boggles the mind how he has gotten away with it. Planet Money coverage hasn't just been friendly to banks and the finance industry in general—some of it has been suspiciously lined up and in synch with specific policy priorities of its exclusive sponsor, Ally Bank. One example: In 2009, just as Planet Money inked its exclusive sponsorship deal with Ally Bank, Davidson began broadcasting a number of segments critical of the proposed Financial Consumer Protection Agency Act of 2009, questioning the need to regulate consumer financial products like mortgages and credit cards in order to protect people against bank fraud. "Will it work at all?" Davidson asked in one of his fake "gee-whiz" questions. "Is this just one more layer of regulation in a regulatory system that fundamentally broke down?" In May 2009, in the heat of the banking industry's massive pushback, Davidson essentially mugged Elizabeth Warren, the chief architect of the financial consumer protection bill, in an interview that took a sharp and bizarre hostile turn early on. Davidson surprised Warren and his own listeners with uncharacteristic personal smears, trying to portray her as a clueless, power-hungry ideologue. Davidson’s attack on Warren was so out of line and uncharacteristically hostile that it sparked a torrent of criticism from NPR listeners who couldn't understand why Davidson or NPR would do such a thing. Keep in mind, this was in the spring of 2009, when unemployment was still shooting through the roof, the future of the economy was in doubt, and talk of a 1930s-style Great Depression-2 was still front and center. ADAM DAVIDSON: What it feels to me is what you are missing is that -- I think we put aside your pet issues. We put them aside. We put them aside until this crisis is over. ELIZABETH WARREN: The cr-- What you're saying makes no sense. Now come on. [interpolate Davidson sputtering and attempting to interrupt throughout.] It makes no sense. On an emergency basis, on one day, one week, one month, there's no doubt in my mind we've got to step in, we've got to make sure we have a functioning banking system. I think I've said that like nine times now. Of course we've got to have a functioning banking system. ELIZABETH WARREN: What, if they can't pay their credit card bills the banks are gonna do fine? Who are you looking at? ELIZABETH WARREN: Who says a bank a bank is going to survive -- Who is not worried about the fact that the Bank of America's default rate has now bumped over 10%? That's at least the latest data I saw. So the idea that we're going to somehow fix the banks and then next year or next decade we're going to start worrying about the American family just doesn't [Davidson talking over] make any sense. DAVIDSON: The American families are not -- These issues of crucial, the essential need for credit intermediation are as close to accepted principles among every serious thinker on this topic. The view that the American family, that you hold very powerfully, is fully under assault and that there is -- and we can get into that -- that is not accepted broad wisdom. I talk to a lot a lot a lot of left, right, center, neutral economists [and] you are the only person I've talked to in a year of covering this crisis who has a view that we have two equally acute crises: a financial crisis and a household debt crisis that is equally acute in the same kind of way. I literally don't know who else I can talk to support that view. I literally don't know anyone other than you who has that view, and you are the person [snicker] who went to Congress to oversee it and you are presenting a very, very narrow view to the American people. The Columbia Journalism Review described the Planet Money interview as a "disaster" and "really cringeworthy stuff from Davidson," who was so rude and unprofessional that NPR's Ombudsman was forced to issue a public apology for his behavior. Davidson's excuse: he had been traveling for a NPR fundraiser and was "very, very tired." What Adam Davidson did not disclose to the public was that at the same time he was smearing Elizabeth Warren and attacking legislation that would protect consumers against the sort of bank fraud that has devastated millions of Americans, Ally Bank, the sole sponsor underwriting Davidson's Planet Money show and his salary, was simultaneously spending hundreds of thousands lobbying against the Financial the Consumer Protection Agency Act of 2009. Ally Bank is not the only financial company funding Adam Davidson’s career and filling up his bank accounts. On top of Ally Bank's exclusive sponsorship of Planet Money, Davidson earns lucrative speaking fees from banks and financial companies, including J.P. Morgan, Well Fargo, Bank of America and Goldman Sachs—the same companies he covers as a journalist. Davidson is frequently the only journalist/reporter booked to speak at these events; other speakers usually work in finance. In April 2011, Davidson was the headlining speaker at the 9th Annual "Women's World Banking" Microfinance and the Capital Markets Conference. The conference was hosted by J.P. Morgan, but the organization itself is funded by the world's biggest banks and corporations, including BP, Morgan Stanley, Pfizer, Barclays Capital, VISA, ExxonMobil—just to name a few. In 2011, Davidson spoke at another microfinance conference, this once was also funded by Morgan Stanley, Citi, Bank of America, Deutsche Bank and CapitalOne. In 2012, Davidson spoke at the 27th Annual Conference for the Treasury & Finance Professional. Sponsors of the event included Bank of America, BlackRock, BNY Mellon, Bloomberg, Citibank, Findelity Investments, Goldman Sachs, J.P. Morgan, Morgan Stanley, Well Fargo and about a dozen of the most powerful financial companies in the world. These speaking fees are a huge unaddressed problem in news media and academia. As explained by Charles Ferguson, director of Inside Job and author of Predator Nation, the problem with speaking fees is that they are “sometimes used to launder or disguise payments . . . for lobbying and policy advocacy.” That is why, for example, Obama's former economy czar Larry Summers was roundly criticized for taking hundreds of thousands of dollars in speaking fees in 2008 from the same banks he was bailing out in 2009. Chicago Public Media, which co-owns "Planet Money" through its ownership of "This American Life," explicitly bars conflicts-of-interest: "WBEZ journalists must uphold the trust of the public by not overlapping individual interests with professional responsibilities. WBEZ journalists may not accept any form of compensation from the individuals, institutions or organizations they cover." Neither NPR nor This American Life would comment on S.H.A.M.E.’s investigation into Adam Davidson’s conflicts of interest. We will be seeking to get comment from Davidson's other employer, The New York Times, about their policy on journalists having conflicts of interest.